Mario Kart DS is a true masterpiece there's little doubt about that, but does it live up to the standards that Mario Kart Wii, 7, and 8 have set? Well there's only one way to find out! 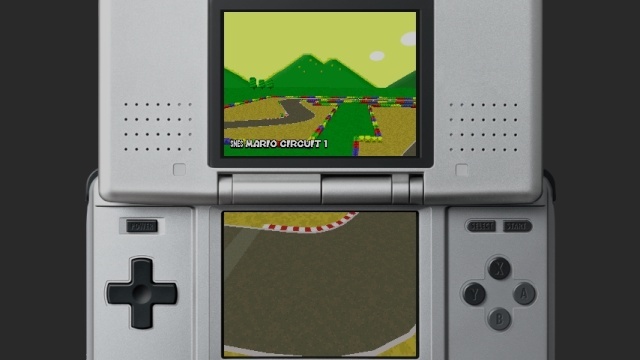 Mario Kart DS has some fairly tight gameplay and decent A.I. compared to earlier entries in the series, but the learning curve can be quite steep, especially since learning to snake for boosts is a must in this game, doubly so in the higher CC settings. The controls, while better than Mario Kart 64, and Super Circuit's aren't on par with the much more responsive controls introduced in Mario Kart: Double Dash. As far as the tracks they are pretty decent and have some pretty good details for an early DS title! There's also a ton of unlockable content in this game including characters and karts which will keep you coming back to this game for some more! The game also features a true battle mode, unlike Mario Kart 8 that can be played solo vs. CPU players! This is very important as the Virtual Console release of this game doesn't allow for local or online multiplayer which really hurts this game's score. Mario Kart DS' audio-visual presentation is terrific with very nice 3D graphics for an early DS title and incredibly catchy and enjoyable music that the series is famous for! The characters also have limited voice acting which is another nice feature! With superb gameplay, tons of content, and an excellent audio-visual presentation Mario Kart DS will provide gamers endless hours of fun, however slightly tricky controls and the lack of multiplayer of any kind does prevent this game from receiving a perfect score. Regardless we still highly recommend downloading this amazing game! 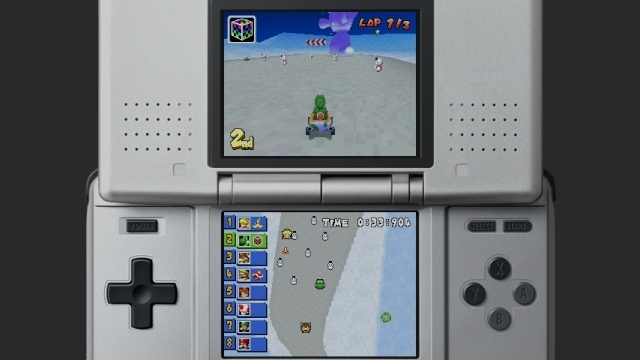 Mario Kart DS in the Wii U! Yeah! It's here and it's just for you! Right! 32 courses, man, it's so rad! So full of content you'll think it's mad! Lemme hear you say "tap-turning!" 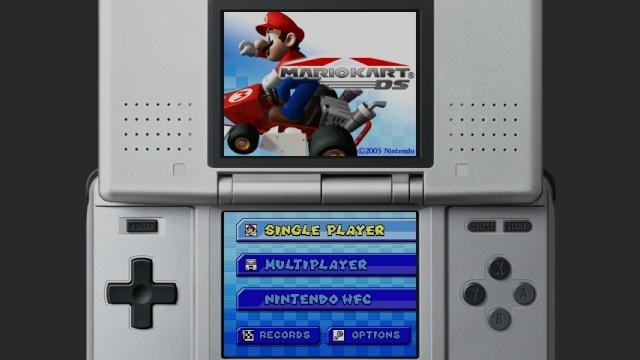 ...Mario Kart DS is back! WOO! Mario Kart DS is my least favorite game in the series. I still enjoyed it, but the courses seemed bland compared to the other games. I Couldn't agree more with this review! It's a great game, but no multiplayer is disappointing to say the least. I wouldn't give this a 9/10 with the missing online and multiplayer. Still nice review I suppose. This was my first portable Mario Kart game, ah the memories!